Last night was our last night in Barcelona. And as well as saying goodbye to our wonderful friends who we see far too rarely for my liking, Arthur had to say goodbye to his favourite new toy. Every time we went over to our friends’ house Arthur would gravitate towards the girls’ toy pram and baby Clara. He liked to give her cuddles, but also I think the pram was an extension of his growing love of anything with wheels – cars, buses, tractors, motorbikes. Accordingly he christened her the brmm brmm baby. Arthur spent hours pushing her around the living room and terrace, his evident delight both adorable and more than a little bit amusing. He doesn’t have any dolls yet: I’ve been thinking about making him one, and may need to make that a priority now we’re home. I’d like to encourage this nurturing instinct he’s developing, and it would definitely help focus the imaginative play he’s increasingly leaning towards. I guess I’ll need to give him the option of a pram as well as a sling to transport his baby too! There were lots of brilliant things about this week – standby for a longer post about exploring Barcelona with a toddler – but one of the best bits was watching him play with the two little girls who, through their mum, were really my first introduction to motherhood. They were remarkably patient with him, and very good at sharing their toys – especially the brmm brmm baby. 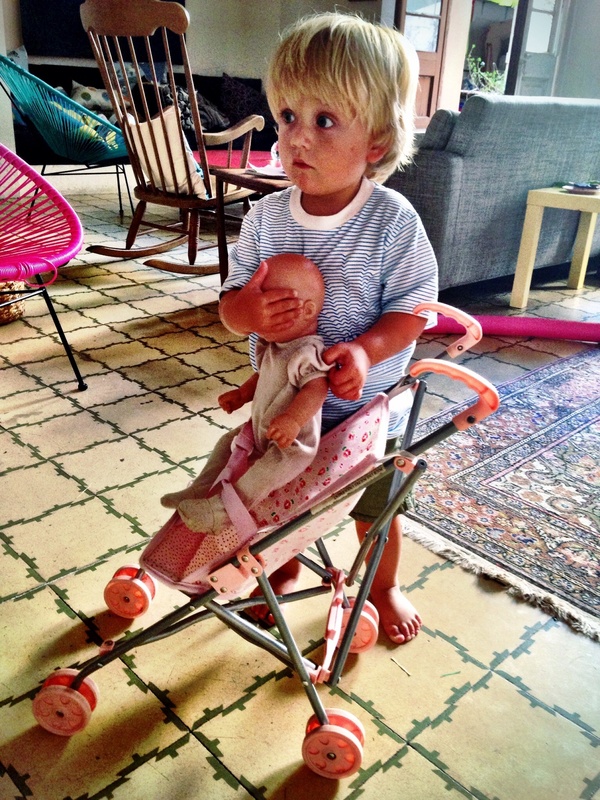 This entry was posted in Sophie is parenting, Sophie is travelling, Uncategorized and tagged baby doll, gender, let toys be toys, play, pram, sharing toys on August 11, 2014 by sophieblovett. Great photo! Sounds like you’ve had a great holiday. Just popping over from Mummy Tries Blog Tour to say hi! Love the idea of Brum Brum Baby, I’m all for letting small boys (indeed all kids, but I’m a mum of three boys) develop their nurturing side. Mine used to push buggies with a toy in the seat and a load of rocks and twigs in the under seat storage bit!